but the word of God has not been bound. ἀρνήσασθαι γὰρ ἑαυτὸν οὐ δύναται. for he is unable to deny himself. Recall that 2Ti 2.1-13 is likely one section, with subsections of 2Ti 2.1-7 and 2Ti 2.8-13. See previous entry on 2Ti 2.1-7. Μνημόνευε Ἰησοῦν Χριστὸν] Here μνημονεύω is an imperative, in the second person singular; Ἰησοῦν Χριστὸν (accusative) is the object of the verb. Timothy is to remember Jesus Christ. Paul provides other supplementary information about Christ, discussed below. ἐγηγερμένον ἐκ νεκρῶν] participial clause, here further describing “Jesus Christ”. One important aspect of Paul’s gospel is that Jesus Christ was raised from the dead. ἐκ σπέρματος Δαυίδ] prepositional phrase, this as well modifies “Jesus Christ”, providing us even more essential information about him: He has not only been raised from the dead, he is also of the seed of David. κατὰ τὸ εὐαγγέλιόν μου] prepositional phrase, with accusative object. I believe that this as well modifies “Jesus Christ” and acts as a summary statement: “Remember Jesus Christ … according to my gospel”. Note ESV’s translation, “as preached in my gospel”, which inserts a verb (“as preached in”) that doesn’t actually exist in the text. ἐν ᾧ κακοπαθῶ] another prepositional phrase, this with a relative clause (headed by a dative relative pronoun) as the object, “in which I suffer”. The pronoun’s referent is Paul’s gospel. He suffers because of what he preaches (some content of which is reflected in the emphasis on Jesus Christ, risen from the dead, and of the seed of David). μέχρι δεσμῶν] μέχρι can be parsed as an adverb or as an improper preposition. Here the phrase provides further circumstance to the suffering, indicating the extent of which or degree of which Paul will endure: he will “suffer even to the point of being imprisoned” (BDAG). Here δεσμῶν is best translated using “bound” in some way (“bound in chains”) due to the play on words in the upcoming αλλα statement. ὡς κακοῦργος] adverbial, further circumstance to the main verb, κακοπαθῶ. Note also the κακ* stem being repeated (cf. κακοπαθῶ above). Paul suffers “in chains/bonds”, he suffers “as a criminal”. ἀλλὰ ὁ λόγος τοῦ θεοῦ οὐ δέδεται] Here the αλλα offers correction to the previous statement. Paul has set himself up as an example. He preached his gospel, concerning Christ’s resurrection, and as a result suffered as a criminal, even being imprisoned. But, Paul avers, “the word of God has not been bound!” Here the contrast is in the binding. Even though Paul has been shut up in prison, the word of God has continued its proclamation. Paul takes heart in this, and is exhorting Timothy to continue in preaching Jesus Christ, to continue to ensure that the word of God will be preached and proclaimed. διὰ τοῦτο] Fronted prepositional phrase, providing circumstance to the following verb. The referent of τοῦτο (“this”) is likely looking back (thus following Marshall, ICC 737; though cf. Knight, NIGTC 398, who sees it as looking ahead). πάντα] Fronted object. Translated “all things”, serves as the object of the verb. Runge labels it with “main clause emphasis”, though it isn’t “emphasized” as one would normally think. Runge says it is the most important information in the clause. ὑπομένω] Present active indicative, here in the sense of “endure” (cf. 1Ti 6.11). Paul endures all things because of Christ and the gospel. See also v. 12 below, where the same word is used (in the “faithful saying”). διὰ τοὺς ἐκλεκτούς] prepositional phrase, “for the sake of the elect”, providing circumstance to the verb. Paul perseveres in spite of persecution so that he is a continuing example to those who will later be persecuted. ἵνα καὶ αὐτοὶ σωτηρίας τύχωσιν] subordinate clause, ἵνα + τύχωσιν, “so that they may obtain”. Note the extra inclusion of the pronoun αὐτοὶ, “they”, making the subject explicit instead of implicit (via grammaticalization of the verb person/number). This is a specific referent, referring back to the elect. Also notice the “adverbial” καὶ; usually translated “also”. Lastly, σωτηρίας (accusative) is what is also being obtained. On salvation language in the Pastoral Epistles, see George Weiland, $amz(1597527211 The Significance of Salvation: A Study of Salvation Language in the Pastoral Epistles), who discusses this specific instance as well as every other instance in the PE. τῆς ἐν Χριστῷ Ἰησοῦ] Here the article functions like a relative pronoun, thus this structure functions like a relative clause; the prepositional phrase provides circumstance to the implied “is” verb; “which is in Christ Jesus”. The referent of the article functioning as pronoun is σωτηρίας in the previous clause. μετὰ δόξης αἰωνίου] prepositional phrase, providing circumstance to the verb of the subordinate clause. Note: πιστὸς ὁ λόγος is a catch phrase in the Pastoral Epistles. The full scope of it will not be examined here. Sometimes it is cataphoric, sometimes it is anaphoric. See Knight, $amz(0801054028 The Faithful Sayings in the Pastoral Letters), for more information. πιστὸς ὁ λόγος] Here this acts almost like a quotation formula, indicating some sort of likely quoted material that follows as worthy and somehow relevant to the current context. It is followed by four conditional clauses, which various commentators have made various suggestions concerning the relationship between clauses and progression of subject matter within the clauses. γὰρ] The γὰρ offers support, connecting the introduction to the “faithful word” to this group of clauses. Several commentaries (Marshall is best; Mounce and Knight are also worthy of consultation) handle the four statements as a unit, discussing possible approaches to them. The interesting aspects to me involve the tenses of each conditional clause as well as any semantic contrast present by virtue of concepts/words used. Also necessary is to recall the larger context from above; Paul has just laid out essential aspects of his “gospel”; he has said that even if he is bound, the word of God is not bound; he has encouraged Timothy to continue to proclaim his gospel; he has noted his own motive for “enduring all things”, which is to bring Christ’s salvation to the ones who are his. Here the “faithful word” justifies/provides support for Paul’s action, and for Paul’s exhortation of Timothy to endure as Paul has endured. εἰ γὰρ συναπεθάνομεν, καὶ συζήσομεν] conditional clause. The καὶ is adverbial. Note contrast in the verbs, between aorist “we died together” and future “we will live together”. The καὶ ties the two actions together, bringing an almost sequential vibe to the wisdom saying. εἰ ὑπομένομεν, καὶ συμβασιλεύσομεν] conditional clause. The καὶ is adverbial here as well. Here the contrast in verbs is between the present tense “if we endure” and the future tense “we will also reign”. Again, the effect is to create sequence between the two verbs. Note also lexical cohesion with earlier instance of ὑπομένω in v. 10, above. Here present difficulties, if rightly endured, are rewarded in the future. εἰ ἀρνησόμεθα, κἀκεῖνος ἀρνήσεται ἡμᾶς] conditional clause. Here the first verb is a future tense verb; the crasis κἀκεῖνος (και + ἐκεῖνος) consists of an adverbial και and the demonstrative pronoun. This is interesting because of the function of the demonstrative. Runge (following Levinsohn) calls ἐκεῖνος in such circumstances the “far demonstrative”, hence a sense of “that” or “that one” is intended. This, combined with the middle voice of the repeated verb could be translated “if we deny [him]; that one, he will also deny us”. The effect is to focus on the second party who is somewhat removed from the current context, the one initially denied, and his reaction to the denial. I’ve not followed this translation above, but that is largely because it sounds clunky. The sense is there, and I may revisit to see if some of the idea can be worked in more smoothly. εἰ ἀπιστοῦμεν, ἐκεῖνος πιστὸς μένει] conditional clause. Again, note the tenses of the two verbs; here they are both present. Also again note the presence of ἐκεῖνος, the “far demonstrative”. Again, it could be translated “If we are unfaithful, that one, he remains faithful”. Also interesting is the lexical cohesion; here μενω could be seen as part of a semantic chain with the two previous instances of ὑπομένω (vv. 10 & 12). ἀρνήσασθαι γὰρ ἑαυτὸν οὐ δύναται] This offers support to the previous clause, God remains faithful because he cannot deny himself. This provides the motive/support for remaining faithful. Some (e.g. Runge, Knight, Marshall, Mounce) see the cause as functionally subordinate while others (e.g. OpenText.org) mark it as a separate top-level clause. Some lexical cohesion within the unit is present with the repeating of ἀρνήσασθαι (cf. v. 12b above). The infinitive clause functioning as complement (ἀρνήσασθαι .. ἑαυτὸν, “to deny himself”) is fronted, with a negator and a verb following (“not he is able”). The infinitive clause completes the primary verb (“he is not able to deny himself”). 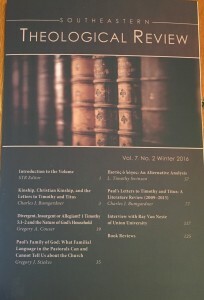 I was able to catch a couple of Pastoral Epistles related papers at ETS and to meet some readers of this blog. Particularly good, I thought, was Tim Swinson’s paper ” ‘Faithful Sayings’ or One Faithful Word? Another View of πιστος ο λογος in the Pastoral Epistles.” Swinson argued that this phrase in the Pastorals should be translated “The word [i.e. the gospel message] is faithful,” and I found the argument quite convincing. I want to look into the issue further. I won’t mention more of is argument here since I assume it is part of his dissertation which is in progress, but if the paper is made available (the audio is available, I assume specific sessions will eventually be available), I commend it to you. I also eagerly anticipate the completion of the dissertation.